So this morning I could hear my kids jump out of their beds and come running down the hall yelling that they were excited to find our elf Streamer. I smiled in my half asleep state because I love the excitement in the morning when they go to find their tiny friend. Then I shot out of bed and started running for the front room when I realized…I forgot to move Streamer the night before! By the time I got to the front room–where he had been perched high on the shelf the day before– the kids were already there scratching their heads in confusion. “Why didn’t he move, mom?” “Somebody touched him, huh!!! ?” I explained that he probably liked that high spot up in the room where we spent a lot of our time. He can be around us more when he’s up there. Then I had an idea, but I had to hurry. 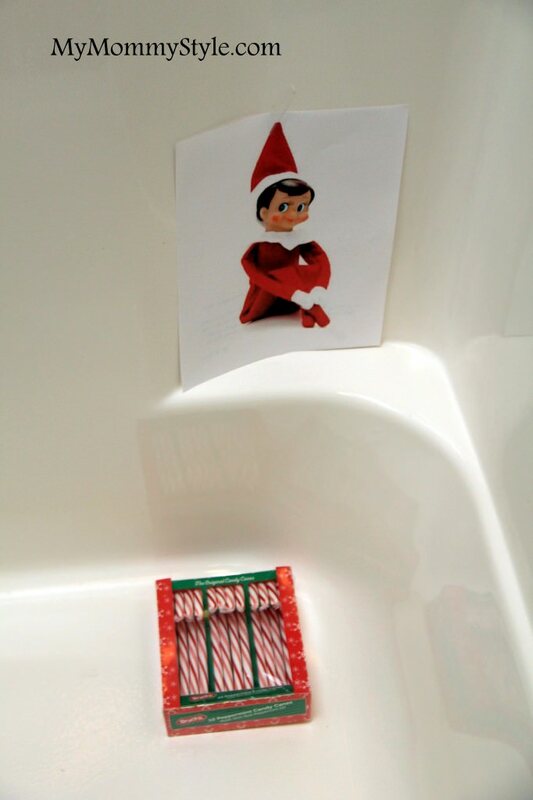 I printed a picture of an elf on the shelf from the internet, wrote a note on the back (explaining that he liked where he was and thought he’s stick around one more day) and stuck it somewhere in the house that I knew they hadn’t been to yet, which happened to be the bathtub in their bathroom. For those that are freaked out by the elf, I’m sorry to cause the mental image of a picture of him in the bath, but the beauty of a picture is it can be removed. 🙂 Anyway, I happened to have a box of candy canes that I bought the night before and I added those with the note. It did the trick! They were delighted by the candy (of course) and thought Streamer was a clever, sneaky elf. Here are a few more things Streamer has been doing this week. Here he is on his favorite spot in our front room. 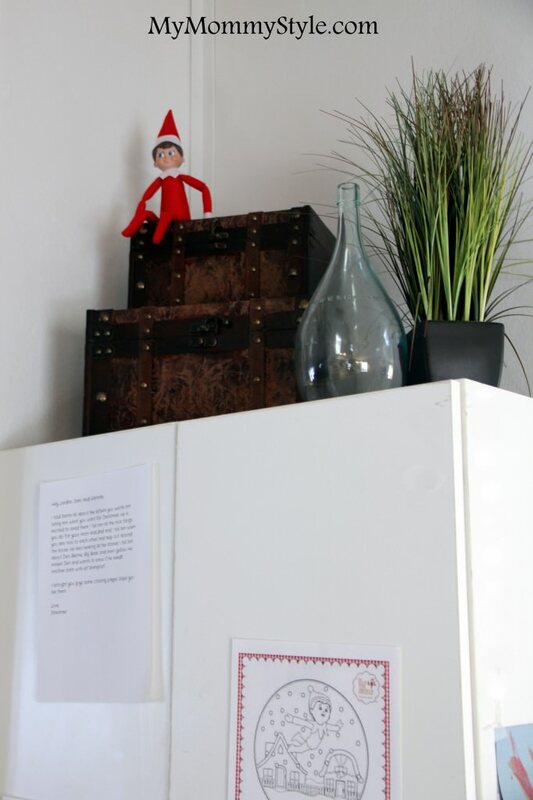 The first day he was there he brought elf on the shelf coloring pages for them to work on that day. One day he was playing Angry Birds with some of the pigs and birds we have around the house. He even built a pig tower to sit on with the other pigs. I have been wanting to do a Christmas book advent for awhile and this year I finally decided to do it. In September I went on ebay and found an elementary school teacher selling a bunch of her holiday books for way cheap and jumped on it. I got 24 Christmas books for around 50 cents each. You could easily wrap up any book you have in the house or even library books. Our library only allows you to check out two holiday picture books at one time though. I have LOVED reading the books with them each day and they love that they get to open a present. It’s a fun tradition. The day after we hung our lights on the outside of our house Streamer wanted to join in on the fun and “helped” out by stringing lights in the kitchen. I couldn’t get a picture of the whole thing, but there were a lot of lights. He ended up getting wrapped in the lights at the end and was stuck hanging there the rest of the day. The kids thought it was hilarious AND they thought he was so smart to hang lights inside. Silly elf. Anyone else doing elf on the shelf? 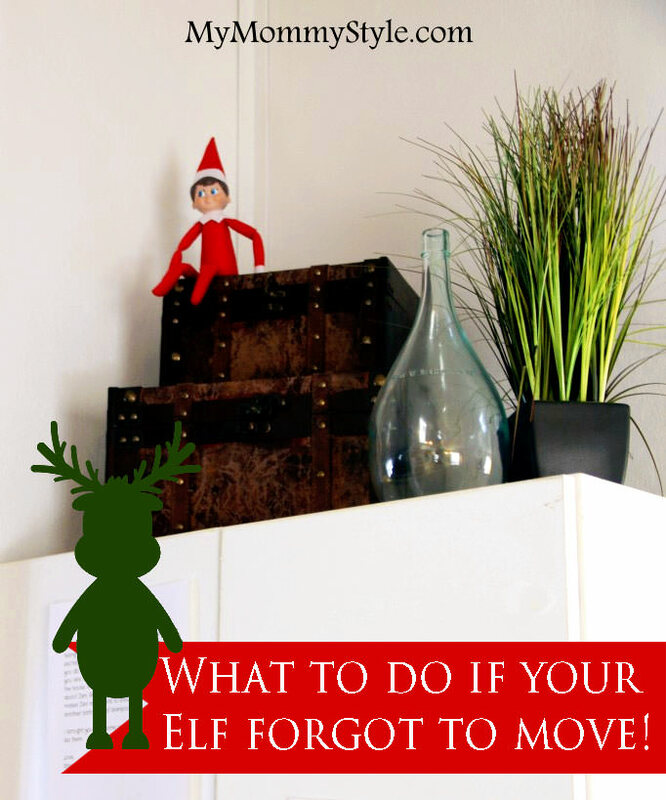 What have your elves been up to this week? As a bunch of parents we were always forgetting as well… we just started a free service called ElfReminders.com that allows you to set email or text reminders for any time of day so that you dont forget…. Reminders come from ‘ElfWink’ so that if a child sees the email/text they will now know what it means.